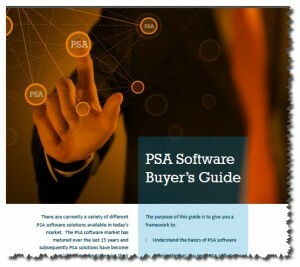 Oakville, Ontario – June 2014 – Promys Inc., a leader in PSA software for the IT solutions provider industry, is excited to introduce the new PSA Software Buyer’s Guide. Promys believes that there is no longer a “best in class” PSA solution, only the PSA solution that best fits your particular requirements for your company’s specific needs, which is why Promys developed the PSA Software Buyer’s Guide as a free download to assist business owners and management teams who are investigating their PSA software options. Interested businesses can download this essential PSA software guide free by visiting our PSA Software Buyer’s Guide download page. “IT Solution provider businesses have had great success with our existing Mid-Project Profitability Scorecard which identifies gaps in mid-project profitability and our Quick Start Guide to Labor Utilization which offers an additional layer of insight and labor metrics to make informed decisions,” Breakey continues. For more information about Promys, please visit promys.com or call 1-866-728-2345 or email us at info@promys.com. The PROMYS professional service automation software was originally developed in 1998 to address the fundamental problem that the IT solution provider and it systems integrator industries face; how to tie services together with complex equipment solution delivery and multi-layered post-sales support. In 2003, PROMYS was spun off as its own corporate entity. PROMYS quickly added customers in the IT solution provider and IT systems integrator marketplace, including one of the largest and most recognized technology solution providers in the world.